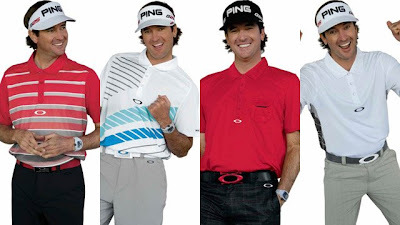 Once again with the Masters we get the proverbial apparel scripts two of the better ones from Puma for Rickie Fowler and for Bubba Watson from Oakley. Thursday: Oakley Fade Polo. Sublimated stripes give big rippers like Bubba a look that sets them apart from the common crowd. Our O Hydrolix yarns keep him dry, and engineered flat seams free movement, eliminate abrasion and max out comfort. Friday: Cross Cut Polo. Soft on the skin and built to breathe, this performance polo is optimized with Oakley O Hydrolix yarns to manage moisture. Angle stripes play off each other for original style while engineered flat seams let Bubba play hard by making sure every swing, pitch and putt is friction-free. Saturday: Must Have Polo. This Oakley original takes Bubba beyond the links when the look and feel of a favorite lifestyle polo, and when he's swinging his signature pink driver, the fully treated O Hydrolix yarns keep him cool, dry and comfortable. Sunday: Side Door Polo. One of the quickest drying yarns in the industry, Oakley O Hydrolix optimizes comfort to keep Bubba cool and focused when he's up against tough putts. Engineered burn-out side panels maximize ventilation, and the look salutes Bubba's pure originality. Wonderful post!Keep up the good work.